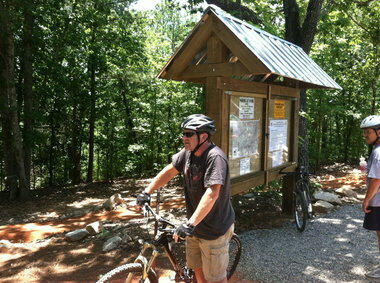 Alabama's Coldwater Mountain Forever Wild mountain biking trails drawing riders (with video) | al.com: ANNISTON -- On a recent Saturday, cars sporting license plates from multiple Alabama counties, and from Georgia and Tennessee, crowded the parking lot for the new Coldwater Mountain Forever Wild mountain biking trails. The first 12 miles of trail, designed by experts with the International Mountain Biking Association, opened earlier this month, and the buzz is spreading about the rollicking ride up, down and around the mountain's heights. Beginners can speed around an easy-to-handle 1.5 mile loop that rides like a woodland roller coaster. The more adventurous can try a 10-mile loop that peaks on a 1,600 feet mountaintop, then takes a 700 foot descent, down 3.5 miles with rolling berms and banked turns. "Central Alabama is becoming a mecca for mountain biking in the Southeast," an exhilarated Karl Peters of Birmingham exclaimed. Future additions are expected to stretch the system to a 60-mile network. This is the kind of buzz backers of Forever Wild, the state's 20-year-old land preservation program, are hoping to build in advance of November's statewide referendum on whether to continue the program.